In today's customer service world, the phone-based agent is becoming redundant. Most of the contact centres in this country fail to live up to their customers' expectations and have become huge cash-swallowing giants offering very little ROI. Companies need to realise that today's under-35 does not want to phone a contact centre, and the under-20 does not want to send an e-mail. 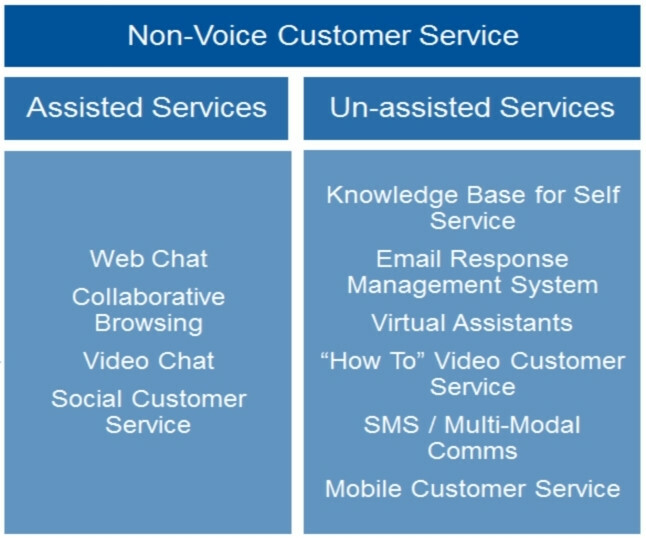 There is, in fact, very little place left for a phone-based agent in today's customer service world. Voice is dead - long live non-voice. 5. Exploit new technologies that deliver a great customer experience. Non-voice goes by a number of different names, and is often referred to as Web customer service or omni-channel services or Web and mobile care. Web chat: A Web chat button on every Web site will allow companies to provide in-channel support and resolve a customer issue immediately. The cost of a Web chat session could also be a third of that of a phone call, with chat agents running up to six simultaneous Web chat sessions. Knowledge management for self-service (KBS): FAQs are evil and should have no place on any self-respecting Web site. They provide pages of potential solutions, but never the actual answer. (Tweet @Bushman10 if you agree or disagree.) The solution is a deep, rich, well authored KBS where customers can ask a question and receive a single, right answer with a relevancy of 85% or more. E-mail response management (ERMS): On average, the SLA for e-mail management is 48 hours or more. With an ERMS, the e-mail can be automatically opened, the content read with natural language processing (NLP), the KBS searched for the single, right answer and a response prepared for an agent to QA and sent. An ERMS can deliver an SLA of 30 minutes or less. Collaborative browsing: E-commerce sites are notorious for abandoned shopping carts. Using a proactive Web engine, a customer on the Web site can be contacted and a shared screen session opened. The agent can then assist the customer with any queries, and in this manner, reduce the abandoned shopping carts by between 35% and 45%. Virtual assistants: These are avatars that live on the Web site or mobile phone and introduce a component of gamification resulting in increased stickiness. Examples are SIRI and Watson. Video knowledge: The company and its customers can record videos on the process or method of resolving an issue. These videos can be stored in a KBS and searched, and provide a much easier way of communicating a process as opposed to a lengthy written document. Social customer service: Social communities allow customers to support each other. It is also an excellent place to monitor what customers are saying about the company, and to gauge the voice of the customer. Inappropriate use of social does, however, often cause more harm than good. It is therefore important to understand the power of social customer service. Mobile customer service: This goes way beyond developing an app to replicate an existing Web site. Using the appropriate platform, it is also possible to engage a customer with mobile chat and with mobile video knowledge in order to reach the customers in the channel they are in. Video chat: Although still reserved for selected use cases, video chat has a huge potential of reducing customer-facing agents and centralising expertise. A number of companies are already using video chat as the preferred method of customer interaction. Voice is dead - long live non-voice. SMS with multi-modal communication: The SMS channel is one of the most under-utilised customer service channels. Combining the SMS with embedded URLs and hyperlinks will allow companies to disseminate information much easier, and at a hugely reduced cost. Keep an eye on ITWeb in the coming months, where the best practices for each of the above non-voice channels will be explored and discussed. If you cannot wait, tweet @Bushman10 for more information. Johan Jacobsâ more than 28 years of experience in the global IT industry spans business development, enterprise programme management, enterprise applications, business intelligence and strategic planning. He is a leading authority on customer relationship management (CRM) and has extensive experience in the contact centre industry. From 2000 to 2013, Jacobs worked as a Gartner research director for CRM Customer Service, developing and publishing research on international Web, social and mobile customer service best practices. Jacobs now heads up Wet Dog Insights, an independent analyst and executive consulting service focusing on the application of international best practices and technology on the South African customer service industry. He focuses on reducing the operating costs (and size) of the South African phone-based contact centre, increasing the adoption of self-service and exploiting Web, social and mobile non-voice customer service technologies. Jacobs provides insight and advice on how to best move from expensive voice-based contact centre services to the inexpensive omni-channel architecture of Web, mobile and social services, without falling into the many traps along the way.